“The idea for the series was conceived in the office of Virgin Records in Vernon Yard, near Portobello Road, by the head of Licensing and Business Affairs at Virgin records (1979–1990) – Stephen Navin, and General Manager (1983–1988) – Jon Webster. The concept was taken to Simon Draper (Managing Director at Virgin Records) and then Peter Jamieson (Managing Director of EMI Records (1983–1986)). Jamieson had similar plans to launch such a compilation and he immediately agreed to the partnership. The deal was negotiated and finalised on Richard Branson's boat moored in Little Venice. ...The series took its name from a 1920s advertising poster for Danish bacon featuring a pig saying "Now. That's What I Call Music" as it listened to a chicken singing. Richard Branson had bought the poster for his cousin, Simon Draper, to hang behind Draper's desk at the Virgin Records office. Branson wrote "He was notoriously grumpy before breakfast and loved his eggs in the morning, so I bought him the poster, framed it and had it hung behind his desk.". 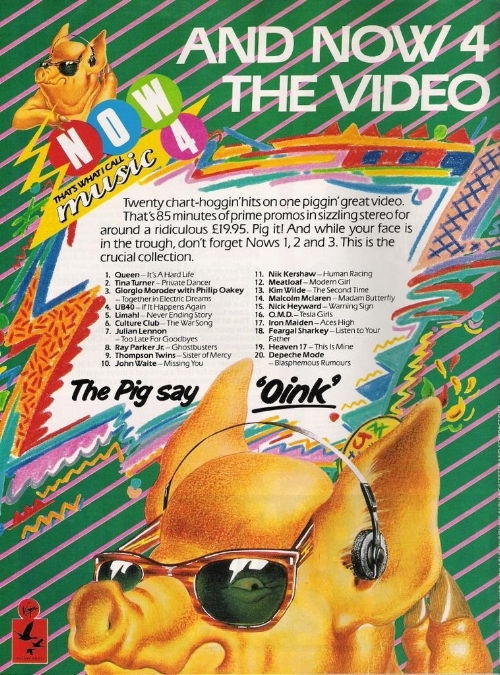 The pig became the mascot for the series', making its last appearance on Now That's What I Call Music 5. 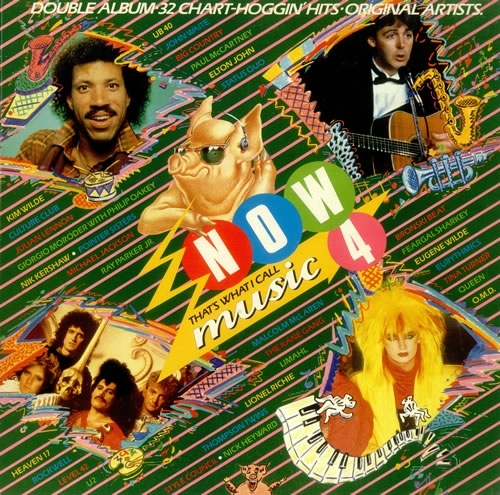 It has recently made a reappearance on the cover of Now That's What I Call Music! 100, which is to be released on July 20th, 2018. The first Now was released on 28 November 1983 and featured 30 UK hit singles from that year on a double vinyl LP or cassette. Although the compilation of recent hit songs into a single release was not a new concept (K-tel and Ronco, for example, had been issuing various artists' compilations for some years), this was the first time that two major record labels had collaborated on such a venture. Virgin agreed to a deal with EMI, which allowed a greater number of major hits to be included (the first album in the series included a total of "eleven number ones" on its sleeve). The album went to number one, and soon after, CBS/WEA's The Hits Album, adopted a similar format to Now!. The two series co-existed for the rest of the 1980s, but when Universal joined the collaboration the Now! series was more successful commercially. The Out Now series by MCA and Chrysalis was also established as a rival to the series, but was short lived. By 1989, Now, Hits, and other various-artist compilation albums were occupying such a high fraction of the UK Albums Chart that a separate UK Compilation Chart was created to restrict the Albums Chart to releases by a single act”. Peter Duckworth is one of the directors of the Now That’s What I Call Music! series and has been compiling for over half his life. In the Sony offices (in London), he and his team are about to commemorate and launch the triple-figured Now That’s What I Call Music! They, like me and many fans, define the year in music by the triple-disc set. The offices are a hive of activity and speculation; planning and cutting. Like any edition of the series, the team have to cut down a longlist and decide which songs are worthy of the final running order. I will bring in a few snippets from a feature that questions Duckworth and asks what comes next. It seems, though, the plans following the much-anticipated one-hundredth release are simple: keeping making them and see how high we can go! There is no reason to stop the series and one has to ask the question: How has it managed to endure and remain popular for so many years?! In an age of digital downloads and streaming; I wonder how many people are listening to an entire copy of Now That’s What I Call Music! and actually getting right the way to the end. The fact the C.D.s are still shifting and there is the excitement of getting the three-disc compilation in hand cannot be understated! The series is a distillation and celebration of the year’s best music from all around the musical landscape. Whilst some claim the Now That’s What I Call Music! is largely Pop-based and takes heavily from the mainstream; that has always been the case, hasn’t it?! Maybe the series throws in the odd edgy choice and angle but look at the tracklist for the last instalment. After you get past its glittery and vivacious cover; you can see the likes of Dua Lipa (IDGAF), Kylie Minogue (Dancing) and Taylor Swift (…Ready for It?) sit alongside offerings from Stormzy, J Hus and Portugal. The Man. That was released in March and, by late-July, we will have that epically-numbered compilation before us. “...I ask how they come up with the running order and they invite me to the mixing day for Now 99. By 35-year tradition, the mixing takes place in a small upstairs room at Abbey Road Studios. Fisher brings her bag of memory sticks and printouts of a spreadsheet that lists about 65 songs for possible inclusion. There’s room on a double-disc comp for about 45. The cull starts at 10am, after the trio are joined in the studio by an engineer, Alex Wharton, who has “been doing this since the late 70s or early 80s, in Now-time”. ...Wharton uploads a couple of gigabytes of songs to a PC attached to a mixing board. He has to crawl in behind the computer tower and thunk in each memory stick. Beside Fisher on a sofa, Pritchard has an iPad, waiting for the midweek chart numbers to come in. Duckworth, on an office chair, twirls a Biro. It’s 10.17am when they start to compile Now 99 and by 10.19am Fisher’s pitch for the first track on disc one – These Days by Rudimental – has been agreed to. Easy. The song’s ubiquitous. Its sales and streams are unarguable. “We try to get that opening section to be familiar with as wide a section of the population as possible,” Duckworth says. Tracks two and three don’t take long either. Dua Lipa? Portugal. The Man? They do a lot of “top-and-tailing”, as Duckworth calls it, repeatedly listening to the first and last 15 seconds of each song to see how they segue into each other. 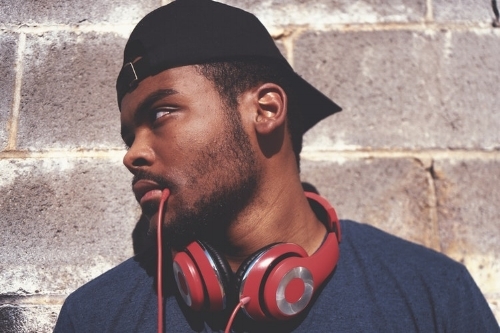 The process will be familiar to anyone who’s obsessed over the momentum of a homemade mixtape”. 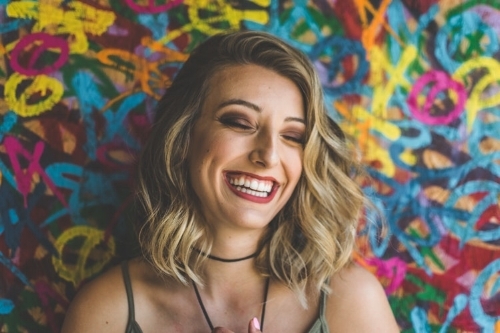 There is a lot of science and calculation when it comes to providing a cohesive and focused mixtape: it is not only a case of tossing the biggest songs together and hoping they all hang together! The dedicated team have to cut the longlist down to the finest and then, before it goes on sale; they need to work at the pace and order to ensure the listener gets the best experience and it is neither too top or bottom-heavy. One of the big reasons why people still talk about That’s What I Call Music! is because it is that time capsule and perfect yearly memory. The fact a song makes it onto one of the C.D.s is the fact it is a hit and resonated. It does not matter where in music it came from: if it has charted and scored big then it wins its place. The meritocracy of the Now That’s What I Call Music! series means you can preserve and encapsulate the flavour of the year – they release more than one edition a year – in this long-lasting and unique series. The fact there are Now-related spin-offs shows how it has captured the imagination and remains enduring and relevant. As we think ahead to the one-hundredth edition and what it will contain; I am looking back at a very special Now That’s What I Call Music! and one of my earliest memories: owning and playing to death the Now That’s What I Call Music! 24 (1993). I was ten (ish) when that came out and in secondary school. The biggest hits of the time, including Snow’s Informer and Shaggy’s Oh Carolina were compiled together for an accessible and exciting treat! I remember the compilation was bought at my local record shop – it has been reincarnated many times over now and long-since died! – and getting out the booklet and reading the little snippets about the songs (when it came out and where it charted). From the corny-but-strangely-brilliant-to-a-young-mind songs like Young at Heart (The Bluebells) and Labour of Love by Hue and Cry to the right-on bangers like Stereo MC's Step It Up; the insane No Limit by 2 Unlimited and Peter Gabriel’s Steam – there were also offerings from Lenny Kravitz and k.d. lang in the pack! Not that I am subjective, but the ten-year-old version of me was delighted to get all the radio-friendly, instant classics in one place. I gloated as I told my school friends I had bought That’s What I Call Music! 24 and we dissected the tracks and picked our favourites. Hearing it (I still have the C.D.!) takes me back to that time when I really started to understand and play music. In many ways, that savvy purchase was the most important thing I did as a child. Every edition of the fabled compilation series is a perfect frame of the time’s music and what was popular with the public. I can remember few aspects of 1993 but, upon hearing the opening notes of Tasmin Archer’s In Your Care and nostalgic conversations and school-time scents are opened in panoramic and Technicolor detail. It is emotional listening to the triple-disc release and remembering how I felt when I first bought it. I remained with the series until 1999/2000 before I moved away from it. 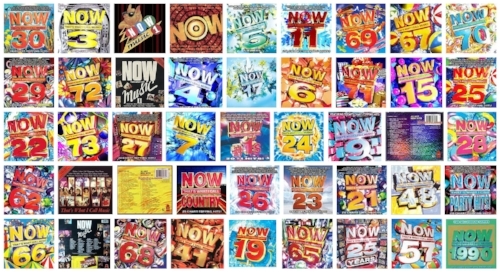 Maybe it marks a tapering-away of my love of the charts – maybe it peaked then – but I still listen to the latest Now That’s What I Call Music! series because it gives me an insight into the mainstream and what is being favoured. I hear, ACTUALLY, that the one-hundredth edition will have a special ring-fenced second disc that is dedicated to nostalgia and the classic tracks – I am excited to see how they whittle thirty-five years of Now That’s What I Call Music! magic into a single disc! The series was born in the same year as me (1983) so I feel a loyalty and sense of companionship. I feel the 1991-1996 period was the zeitgeist and golden age of the music series. One can see the changing of the mainstream and new trends emerge and die in a single offering. In many ways; Now That’s What I Call Music! is a history of music’s changing face and the trends that come and go. I wonder how long the idea will last and whether we still have the same appetite and demand twenty years from now as we do today.